Following the successful debut of her Screen and Sax project at Equator’s ‘Women of the World Series 2015’ at Kings Place, the brilliant saxophonist Hannah Marcinowicz has further developed her association with the cream of British female soundtrack talent. Hannah will be returning to Kings Place on September 30th. 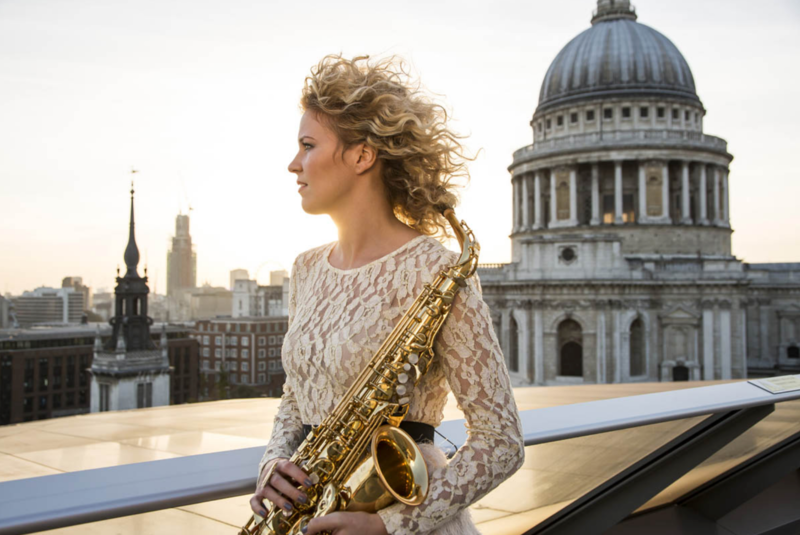 Hailed by The Times as ‘a superb young saxophonist’, Hannah Marcinowicz made her Wigmore Hall debut in 2008. Since then, she has performed as a soloist at venues including the Royal Albert Hall, Royal Festival Hall, Queen Elizabeth Hall and Barbican Centre to great critical acclaim. She has performed with the UK’s leading orchestras, including the London Symphony Orchestra, Philharmonia Orchestra, BBC Concert Orchestra, Royal Philharmonic Orchestra, London Philharmonic Orchestra, BBC National Orchestra of Wales, Royal Northern Sinfonia and London Concert Orchestra. A regular performer at the BBC Proms, she has appeared as a featured soloist under Sir Colin Davis and Paul Daniel. Her international performances include concertos and recitals in the Middle East and Far East. She has also appeared as a guest soloist with the European Union Chamber Orchestra. Hannah frequently records for film, television and radio. She is featured as a soloist on the soundtrack for the United Arab Emirates Pavilion at the Milan World Expo in 2015. Hannah is currently collaborating on a solo album project with the award-winning stage and screen composer, Jonathan Goldstein. Sweet Thames Flow Softly from Hannah Marcinowicz on Vimeo. New commission: ‘Spooks’ composer, Jennie Muskett (British Emmy winning and BAFTA nominated). This commission will be based on the speeches of Michelle Obama and Hillary Clinton, and how they empower women. The speeches will be incorporated as part of the piece. As an avid follower of Dior on Instagram, Charlotte was recently very inspired by Maria Grazia Churi’s beautiful ready-to-wear Autumn – Winter 2017-18 collection. In particular, she loves the quote from the collection’s introduction online.. ‘a nod to the femininity of a colour that unites the ocean depths with the infinity of the celestial vault.’ Charlotte has taken this as inspiration for the piece which is entitled ’Bleu’ and is written for tenor/soprano saxophone and piano. It is composed of two movements, ‘Ocean Depths’ and ‘Celestial Vault’, exploring the two extremities and atmospheres of the colour blue, as well as reflecting the strong and feminine heart of the collection. We would like to display the catwalk show on a screen, whilst the music is being played. This commission will celebrate the life and work of Shirley Walker, one of the great unsung heroines of Hollywood music who, as a ghost writer, rescued many a score by her male counterparts before finally making a name for herself. Lisa’s commission will have an accompanying film, featuring contemporary dance. In keeping with the ‘Women of the World’ theme, and inspired by Mollie Hughes’ recent achievement of becoming the youngest woman in the world to successfully summit Everest from both the north and south sides of the mountain, this arrangement will be performed with an accompanying film showing footage of Mollie’s most recent ascent of Everest. Scored for saxophone, piano, violin and cello. As this concert is a celebration of British female talent, I wish to cover all corners and showcase the next generation of talented female musicians. With the blessing of Sarah Alexander, Chief Executive and Artistic Director of the National Youth Orchestra of Great Britain, I will be joined for this piece by two young female members of NYO.